Summary: Ira Levinson is in trouble. At ninety-one years old, in poor health and alone in the world, he finds himself stranded on an isolated embankment after a car crash. Suffering multiple injuries, he struggles to retain consciousness until a blurry image materializes and comes into focus beside him: his beloved wife Ruth, who passed away nine years ago. Urging him to hang on, she forces him to remain alert by recounting the stories of their lifetime together – how they met, the precious paintings they collected together, the dark days of WWII and its effect on them and their families. Ira knows that Ruth can’t possibly be in the car with him, but he clings to her words and his memories, reliving the sorrows and everyday joys that defined their marriage. AAAHHHHHHHH. Words cannot even begin to describe how excited I am for a new Nicholas Sparks book! And it's about a girl falling for a cowboy? Need you say more? Haha, but this one sounds super cute with the two different couples. I'm really excited to see how it all come together! I love cowboys too! I usually can't do Nicholas Sparks's books because they turn me into a pile of ugly sobs, but I am intrigued by this one. Thanks for sharing! 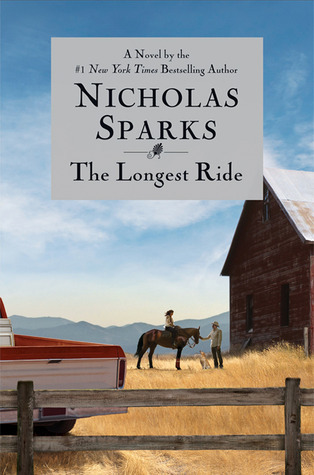 I'm a sucker for Nicholas Sparks' books, so I'm definitely looking forward to reading this one. Great pick! Nice! Don't read contemps, but have read one of his many years ago...A Walk to Remember! Hope you enjoy this one!